Project Assistant responsible for the coordination and monitoring of habitat management tasks. Project Assistant responsible for the studies of monitoring of the fauna and flora and co-responsible for the coordination and monitoring of the habitat management tasks. Project Assistant responsible for the land use management within the intervention area and participation on public processes related to the SPA and other conservation interest areas. Since the start of the LIFE Priolo Project (October 2003), we are proud to have received more than a dozen national and foreign grant holders from different professional and universitary organisations. We continue to collaborate with several national and foreign students completing post-graduate studies. The LIFE Priolo Project also employs people in the tasks of habitat management throughout the year in teams that vary from 10 members (during winter) to 35 members (during the summer, when climatic conditions are better for the land tasks). For this reason, the social impact of the project is important in the area around (specially in the Council of Nordeste), being a employment generator and thereby improving the quality of live of an important number of families in the councils of Nordeste and Povoação. 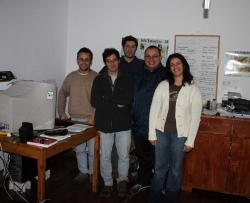 All these professionals and graduates are the guarantee of success of the LIFE Priolo Project!